Sharp MX-2314N PCL6 Driver & Software for Windows 10, 8, 7, Xp (64-bit/ 32-bit) and Manual Installation- The Sharp MX-2314N is a compact photocopier with powerful entry-level color MFP to make it as the best option for small offices and Workgroup. It has a versatile design with a high-quality A3 color for all business levels. The resolution scans for B/W and color is same that is 600 x 600 dpi while the resolution print is 600 x 600 dpi and 9600 x 600 dpi. The zoom range for this machine is from 25% to 400%. 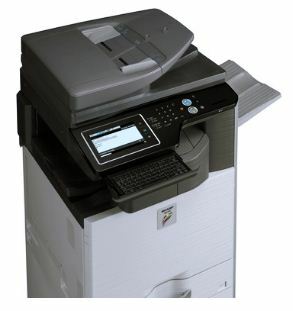 Sharp MX-2314N is a printer, copier, and scanner machine that you can use for sending a fax. The paper capacity is 600 sheets as standard and 3100 sheets as the maximum. The original capacity of the document feeder is 100 sheets. The file formats for scanning is from TIFF, PDF, PFA/A-1b, Encrypted PDF, and JPEG to XPS. For the total cartridge paper, it can hold 20,000 pages. The machine has a fast print and copy speeds, which is about 23 pages per minute even for colored files. It comes with latest productivity features such as the Cloud and the driverless mobile printing, auto two-sided color scanning, network printing, security system, and powerful management solutions as well as Sharpdesk desktop scanning software. There are some upgrades and options you can go with such as 320 GB of hard drive, fax, Wi-Fi adaptor, space saving inner finisher, most security systems, punch module, Sharp OSA you can use to configure MFP for your business, and large capacity drawers for long print runs. You can imagine about your business productivity if you use the new Sharp MX-2314N, especially for all great features in it. Speaking of the network system in Sharp MX-2314N, the scanner has a standard network with some scanner utilities such as Sharpdesk, Sharp Network Scanner Tool, and Sharpdesk Mobile. The printer also has a standard network printer with some protocols such as EtherTalk or AppleTalk, NetBEUI, IPX/SPX or NetWare and TCP/IP for iPv4 and IPv6. The Sharp MX-2314N also offers 7-inch colored touchscreen display for simple and intuitive operation. With the rapid warm-up time, energy star certification, eco scan function, enhanced auto shut down capabilities, efficient LED scanner, and a versatile A3 color MFP, and other features above, we think that it is what you need to run your business. You can find many benefits by using this machine with the A3 Digital Multifunctional Color printer, easy-to-use touchscreen display, fast duplex printings, various connectivity options, high-security systems, and great quality prints with fast output speeds.